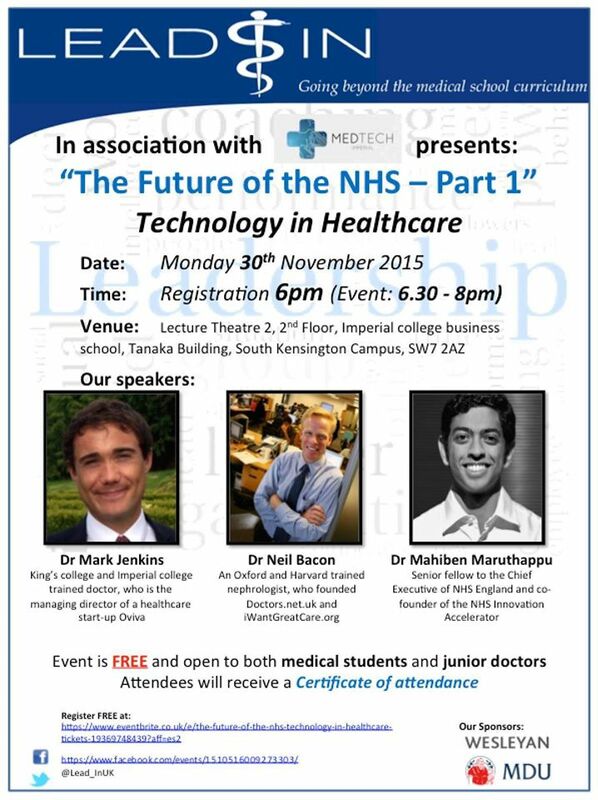 I attend part one of a three part series looking at the future of the NHS. The event was arranged by Lead-In, a medical school society with the aim of teaching medical students and recent graduates about areas of healthcare delivery not conventionally covered within the medical school curriculum. The event at Imperial College London was first in the series was about Technology in Healthcare, as we had three articulate and knowledgeable speakers tell us about their current work and ambitions, as well as share their thoughts on digital and technological health in the world of tomorrow. Speakers for the evening, from left to right, Dr Mark Jenkins, Dr Neil Bacon and Dr Mahiben Maruthappu. Our first speaker was Dr Mahiben Maruthappu, who not only works as a Junior Doctor, but is also a Senior Fellow for the Chair and Chief Executives Office for NHS England, where is gives advice on innovations in healthcare. He gave a great introduction to the evening by explaining not just the problems we face as an industry, but also the options junior doctors have on being part of the solutions. Mahiben discussed the slow but steady increase in opportunities for doctors to work in IT which are being provided by the NHS as fellow positions aimed at doctors in training. He also highlighted the numerous opportunities to support a start-up, or even to get coding so they can better work with developers and other IT professionals on projects. Up next was Dr Neil Bacon, founder of Doctors.net.uk. Neil is very passionate about patients having more control over the healthcare, and enabling them to make informed decisions about where they should be treated and who they should be treated by. Hence the creation of IWantGreatCare.org, Neil’s latest venture. By allowing patients to rate service providers, be those organisations or individuals is in my opinion a refreshing step in the right direction. Although many may agree that healthcare is heading in this direction anyway. It’s no wonder that IWantGreatCare.org is being labelled as the “TripAdvisor of healthcare”. Finally, we had Dr Mark Jenkins talk about working for healthtech start-up Oviva, which provides dietetic services via a mobile phone app. Mark also moonlights as middle grade locum doctor in Emergency medicine, and highlighted that he feels a little conflicted about whether he should continue working clinically or not. This lead to the inevitable question from the audience; “is it worth doing Foundation Training?”. Mark and I agree on this answer; you will learn so much by completing Foundation Training, but if you hate medicine, do something else. The evening ending with some networking with the medical students and newly qualified doctors, where I offered a number of them words of encouragement for the future, especially a group of students who were taking a year out to study Management in Healthcare. Certainly a huge well done goes to Martha Martin, President of Lead-In and her team.